Tamriel is a world created out of the carcass of the last titan. When the titan fell, it went unnoticed by the gods and so a world was formed and allowed to exist outside of their domain. That is, until the Witch Queen Jennesta noticed, and thus she sought to claim it as her own. But that is the stuff of legends. 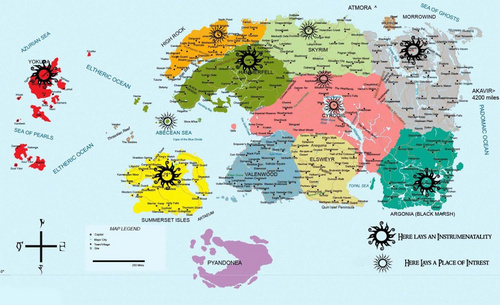 Tamriel consists of a number of realms, countries, that are neither here or there. Each seems to embody a specific characteristic, as if influenced by some external force that created it. Perhaps it is only a coincidence, or perhaps the inhabitants of the lands shaped them in their image.